The ultra-competitive technology industry sometimes becomes the breeding ground to historic rivalries. Some of these rivalries spawn amazing marketing campaigns like the recent ‘thanks for copying us’ twitter meme created by Nokia mocking Apple iPhone 5C. But at times things go overboard and rivalries get nasty with bad-mouthing each other, running attack ads and filing lawsuits which unearths the murky side of the business. 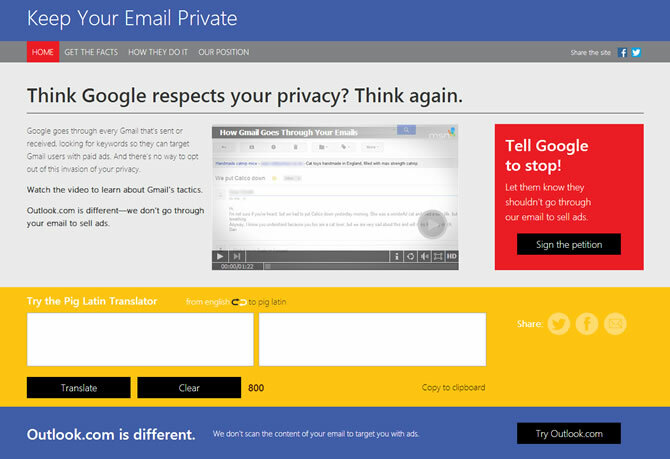 Recently, Microsoft has launched a scalding attack on Google by creating a website that criticizes the privacy issues of Gmail. The website with a snappy name ‘www.keepyouremailprivate.com’ accuses Gmail of spying every email sent or received to look for keywords and target Gmail users with paid ads. The website has various links, statistics and videos comparing Gmail with Microsoft’s own Outlook and puts up a rather compelling case how the later is better. According to Microsoft, Gmail scans through all the emails in the inbox to search for keywords and identifies trends and themes to project ads accordingly. It even displays screenshots of real Gmail accounts and survey statistics of people unhappy with this move. After the whole government espionage fiasco came out in the open this year, people are a little more sensitive towards the issue of snooping and are not talking it lightly. The lack of opt-out option in the Gmail makes it worse and Microsoft is looking to capitalize on it by claiming Outlook doesn’t scan emails. Although the criticism leveled by Microsoft are serious and Google’s latest attempt to put ads almost everywhere does become a little irritating, but to be very frank it does not matter that much. Till the time sensitive data is kept secret and does not fall into wrong hands, everything’s alright. And the ease of using Gmail and its growing integration with Android OS still makes it a favorite. But, an opt-out option should be provided for users who find it a breach of privacy. Hopefully, Google will budge and make necessary changes.